Not to be confused with World 3-1. Area 3-1 is the first course of Teatime Twirl and the nineteenth course overall in Mario vs. Donkey Kong: Mini-Land Mayhem!. It also introduces the Conveyors, a primary gameplay element which is used to move Minis in certain directions. Both Mini Marios begin on a platform on the upper level, with the exit door on the bottom right. In order to reach it, they must simply be guided across some Conveyors and collect Girder Pickups for Red Girders. The M-Token is located on the middle left, atop a Red Girder platform on the middle level. To collect it, the Mini Marios must split up; while one collects the remaining Girder Pickups on the right, the other must move to the left across some Red Girder platforms with precise timing. 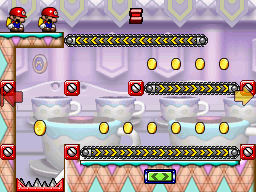 The Mini Mario Card is located on the top right, atop a platform on the upper level. The Mini Marios must be led to it via a Red Girder slope once they collect the big Girder Pickup. In Plus Mode, the Mini Mario must be guided to the exit door first, followed by the Mini Donkey Kong.